Looking at Central European building projects illustrates an awareness of sustainability and the need to save energy. This trend is based on the finiteness of natural resources, and is thus wise to follow. Developments in this region including passive house technologies, and energy plus solutions that create more energy than they use have become realisable. But it is not increasing technological knowledge alone that supported these developments; the Central European climate makes it possible to invent technological solutions that allow for maximum comfort while maintaining low energy consumption. Other regions have experienced a building boom over the past decades that has dramatically increased city sizes. A detailed examination of such building projects illustrates that most of them strive for the international standard with a high glazing ratio in the style of the Central European examples. But how can architecture be transferred to regions with entirely different climate conditions? The answer lies in the technological possibilities we have at our disposal today. The main research question of this thesis refers to utilising the local climate. Which methods are necessary to plan a building - and a façade as the interface between the inside and the outside, in particular - while working with, not against the climate? Sailing has been used as an analogy: only with the knowledge of winds and tides can we use them to efficiently move across bodies of water. Those who have not learned or understood this will have to use a motorboat and pay the price for petrol. Chapter 2 ‘Climate zones’ describes the different climate zones and their particularities, analysed with the help of eight different boomtowns. The mild Central European climate becomes particularly apparent when compared to tropic locations such as Singapore. Here, very high average temperatures and humidity levels require that we rethink and find new solutions. In chapter 3 ‘Principles of climate-adapted architecture’ a journey back in time to traditional building methods and vernacular architecture lets us identify how building styles and building methods derived from an adaptation to the local climate. Have we lost some of this knowledge, and what can we learn to adapt modern architecture to the local climate? The study of traditional architecture is sobering; all or most of the solutions found in traditional architecture have, in principle, been implemented or further developed in modern technological solutions. The Roman hypocaust is the predecessor of modern underfloor heating and the fresh air stream, called “lifeline” in India, that cools down massive walls during the night can be compared to night flush ventilation used in modern office buildings. All of the traditional methods and solutions have made survival possible under sometimes extreme climatic conditions. But the comfort level expected by the modern user and regulated by building codes could have never be achieved. The façade is the focal point of this work because, as an enclosing building component, it connects or separates the interior and the exterior. After a short introduction about the evolutionary history of the façade, chapter 4 ‘The Façade’ describes the reciprocity of the façade with reference to the indoor room climate. Since the possibilities of regulating the indoor climate and thereby the comfort level with the façade itself are limited, chapter 5 ‘Building services components’ includes a description of the building services components necessary to control the room climate. Chapter 6 ‘FET Façade Expert Tool’ describes the process of combining the findings from the previous chapter for a tool to analyse the climate and the combination of façade and building services. The goal of the “Façade Expert Tool” (FET) software tool is to easily analyse the climate of a particular location and to then limit the possible combination of façade and building services components to a practical level. The initial aim to generate the perfect combination of components and therewith the ideal façade and building services after entering a particular location upon a click of the mouse was replaced by the idea of an expert tool that requires basic knowledge of the working principle of the individual components and their reciprocal action. The application of the FET and its recommendations as well as comparison simulations rounds off the chapter. The performance capability of the tool is illustrated by a reduction in energy consumption of up to 50% in the comparative thermal simulations. 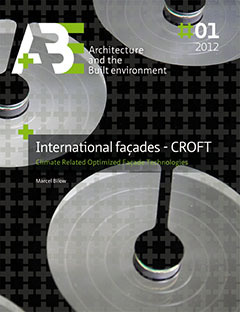 In many cases, the approaches to solutions and examples introduced in chapter 7 ‘Climate Responsive Optimised Façade Technologies CROFT’ under the name “Climate Responsive Optimised Façade Technologies” (CROFT) use reduced glazing ratios recommended by the FET to integrate new technical solutions into non-transparent areas of the façade. To name a few: a condensate trap that enables dehumidification of the outside air in tropical climates as well as a rotating sun protection system that creates the sensation of transparency for the human eye while providing efficient sun protection. The final chapter 8 ‘Conclusion’ takes a critical look at the research, highlights potential for further research and new markets, and summarises the overall results. This thesis can be linked to the fields of architecture, building services and building physics. The focus of the research and the author’s background in architecture is easy to perceive. But beyond purely formative architectural aspects, the building envelope as the interface between the inside and the outside requires knowledge of building physical basics and the function and interaction with or as part of the building services system. The thesis also aims at mediating between different planning disciplines and at supporting an interdisciplinary planning process. If it furthers international diversity in façade design that represents the respective location in addition to reduced energy consumption, the author’s intentions have been met and another step toward a sustainable future has been accomplished.